A common argument made by grammar school enthusiasts is that “our school system already selects on the basis of wealth”. This argument is fundamentally flawed: why make things worse just because there is already a problem? However, this does not mean we should be unconcerned about existing selection in nominally ‘comprehensive schools’. A new report published by The Sutton Trust this week lays this problem bare by highlighting unacceptable social selection in our best schools. The new Sutton Trust report examines the social selectivity of the top 500 schools based on GCSE attainment and the top 500 schools based on Progress 8 scores and finds that whilst the average proportion of pupils eligible for free school meals (FSM) in comprehensives across the country is 17.2%, in the top 500 comprehensives by 5A*-C, the proportion is almost half that (9.4%). Encouragingly there has been some improvement since 2013 when on average only 7.6% pupils in the top schools were FSM eligible. Results are also more encouraging when schools are instead ranked on Progress 8 scores. 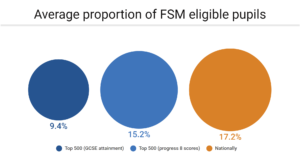 Based on this ranking, the proportion of FSM pupils in the top 500 schools is 15.2%, much closer to 17.2% . Faith schools are among the most socially selective of these socially selective schools. There is, on average, a 6% gap between the proportion of pupils in faith schools in the top 500 (for GCSE attainment) who are eligible for FSM compared to other schools in their own catchment area. This is deeply worrying given that the government now plans to lift the cap on the proportion of their intake that faith schools can select on the basis of religion. We now risk a system in which these already socially selective schools become yet more selective and even less representative of the areas they serve. House prices however are another important driver of ‘selection by the back door.’ ‘Catchment areas’ push up house prices in areas close to high performing schools up, pricing disadvantaged families out of high quality education. The Sutton Trust found that houses close to the top 500 comprehensives (based on GCSE attainment) cost on average £45,700 more than houses in the same local authority, a 20% premium. 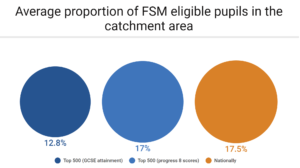 Yet although house prices are an important driver, they do not explain the full selection effect since the average FSM rate in top schools’ catchment areas is 12.8%, which is still 3% higher than their average FSM intake. Only half the FSM gap is therefore accounted for by these schools being situated in wealthy areas. Essentially, if you are a poor pupil whose family manages to live close to a top school, you’re still less likely to go to a top school. Given the worrying levels of bias in intake that this report reveals it is clear that we are long way from schools being able to fulfil their potential for promoting social justice. 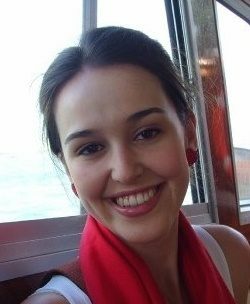 Further selection, whether academic or faith based, will do nothing but worsen the situation. Instead the government should concentrate its efforts on systematically tackling the barriers to equal access.